On Monday, February 12, the U.S. Embassy welcomed scores of enthusiastic attendees at its 2018 Black History Month event - Soldats Noirs. This was a round table discussion about the black soldiers who fought for the U.S. and France during World Wars I and II. 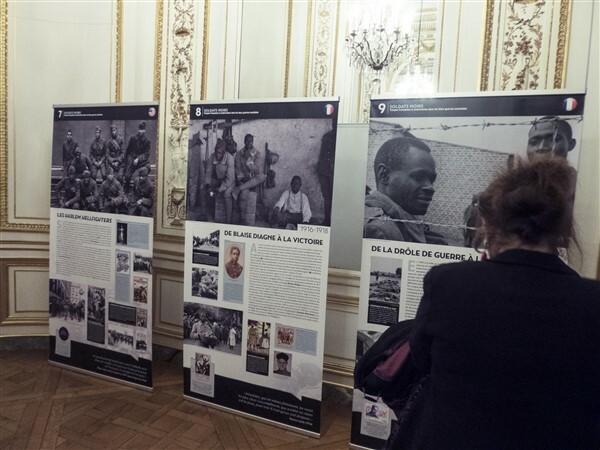 It was held at the George Marshall Center in the Hôtel Talleyrand. 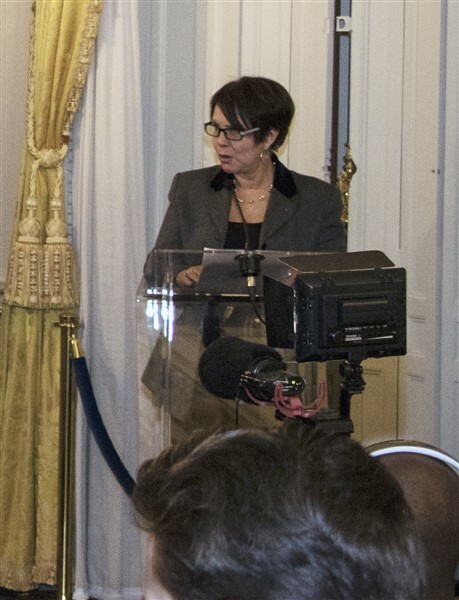 The event was presented entirely in French. 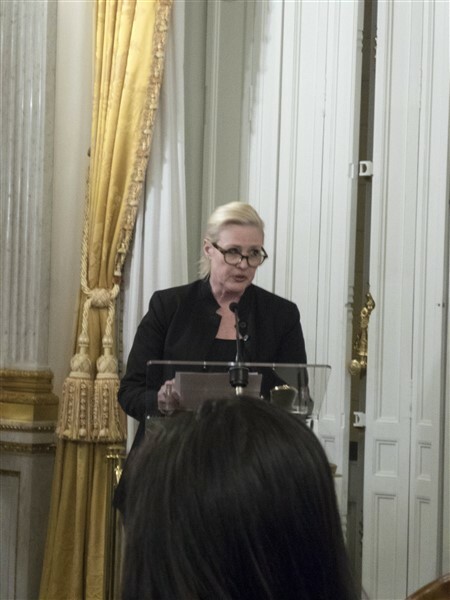 U.S. Minister Counselor for Public Affairs Angela Aggeler and General Director Rose-Marie Antoine of the Office national des anciens combattants et victimes de guerre (ONACVG) (National Office of Veterans and War Victims) welcomed the audience. This was followed by a lively round table discussion about the service of black troops from the United States, Africa, and the Caribbean in the U.S. and French armies during World War I. 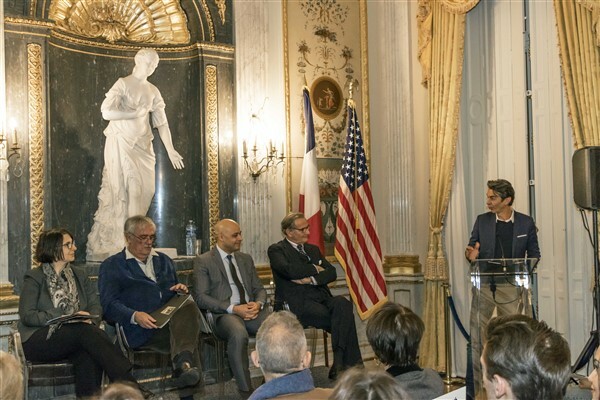 The panelists addressed the role that these troops played in the history and culture of the U.S. and France, as well as the questions of citizenship evoked by their participation in the war. A portion of the film La Grande Guerre des Harlem Hellfighters* was shown to kindle discussion. 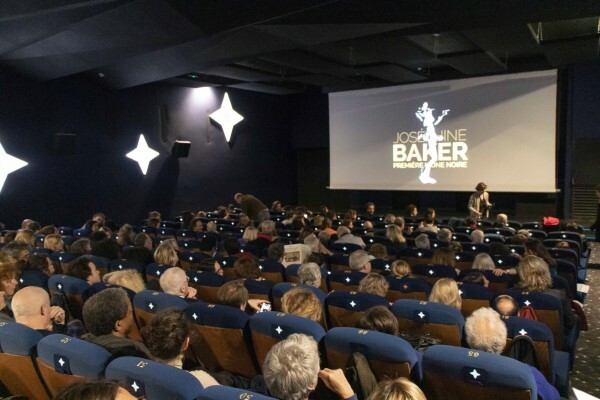 Later, five vignettes were shown from the Frères d’armes film series that honors men and women who have fought for France since the 19th century. After the discussion, the crowd was invited to partake of refreshment and view two exhibitions that were in keeping with the theme of the discussion. 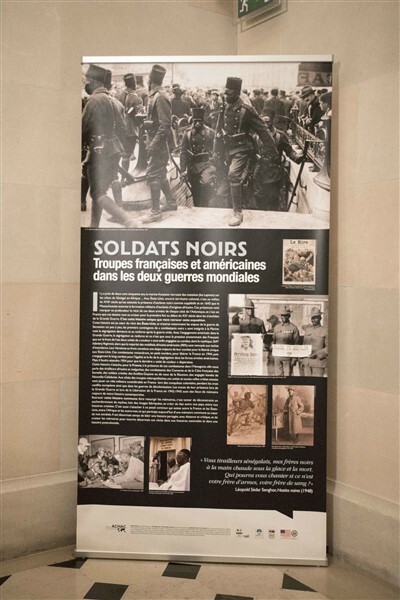 The poster exhibition Soldats Noirs – Troupes françaises et américains dans les deux guerres mondiales (Black Soldiers – French and American troops in the two World Wars)* consists of fourteen (14) panels that present photographs, images, and text concerning various aspects of the service rendered by black troops during World Wars I and II. 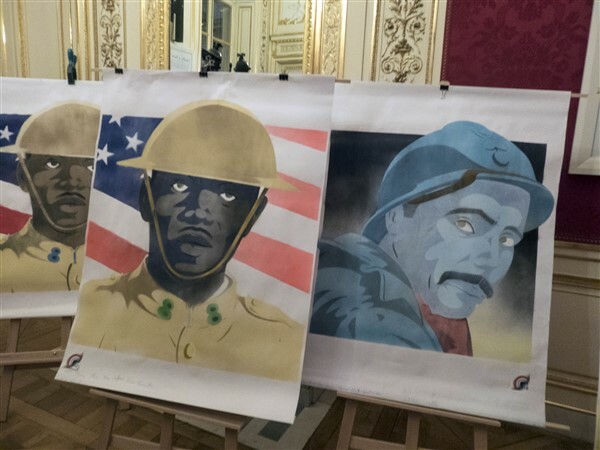 The second exhibition was a presentation of pochoirs (stencil art) of African-American and African soldiers created by children 10-12 years of age who live in the north Paris suburbs of Villiers-le-Bel and Sarcelles. Only since 2015 has their school system included the study of the participation of France’s colonial troops in its curriculum. The students reinforce what they are learning about the soldiers through this art project, entitled “Un Chemin vers la Liberté” (“A Road to Freedom”), which was organized by Collectif Fusion. 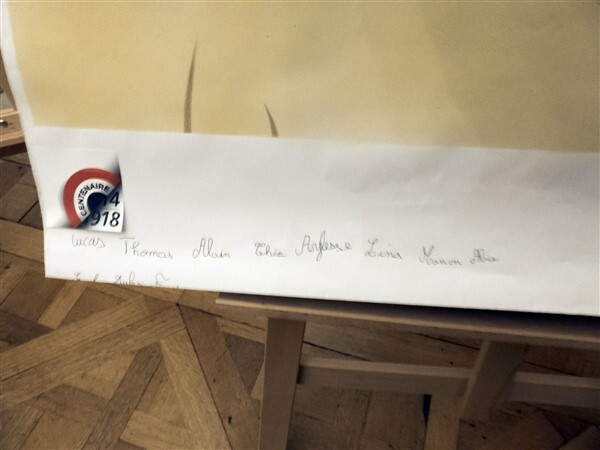 Eighty of the 140 persons attending the event were high school and university students from Paris, Sevran, Bondy, Montreuil, and as far away as the city of Amiens. 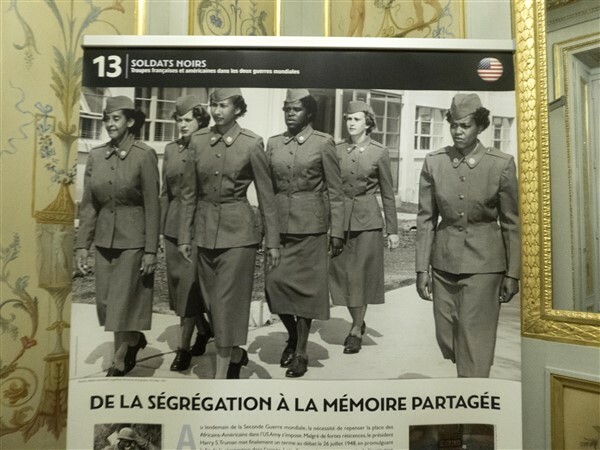 The U.S. Embassy and other partners in the event hope to take the Soldats Noirs poster exhibition into French schools to expand and solidify the impact that it offers. *Pascal Blanchard and André Rakoto participated in the round table discussion held after the screening of the film La Grande Guerre des Harlem Hellfighters (The Harlem Hellfighters’ Great War) at the Cercle National des Armées in November 2017. The Soldats Noir poster exhibition was displayed at this event. Read our blog post about it here: https://www.entreetoblackparis.com/blog/harlem-hellfighters-great-war.